Kinesio Tex Tape, the original brand of kinesiology tape, is a unique therapeutic tool that has become the standard for elastic taping in physical therapy and sports medicine. It creates a lifting effect on the surface of the skin which helps relieve pain and improve circulation. Kinesio Tex Tape can be applied in various directions and with different levels of tension, to either stimulate or relax muscle, without limiting the patients’ range of motion. Now available again in bulk rolls at a lower price point, Kinesio Tape Classic is formulated with the traditional wave pattern that clinicians have utilized for over 25 years. Kinesio Tape FP, the latest version of this unique modality, mimics the human touch, while providing for increased grip, lift and comfort. 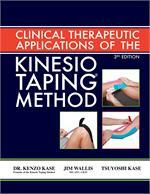 In addition to Kinesio Tex Tape, we offer educational manuals and DVDs to help assist you in implementing the Kinesio Taping method in your practice. Our durable Kinesio Pro Scissors are designed to make continuous smooth cuts and ensure that the blades won’t get bogged down by the adhesive. 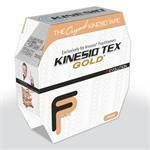 Shop Current Therapeutics at e-current today for all of your kinesiology taping needs!